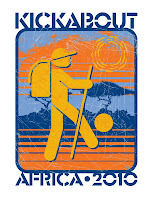 The Kickabout has wandered onto Facebook and we love making friends! Follow the latest and greatest (and even get a head start) news from the Kickabout on Twitter (@thekickabout). Click on the links to learn more and become an active part of The Kickabout! Share with friends, tell us about great projects in Africa, and don't be afraid to be in touch. 0 comments: on "Kickabout on Facebook and Twitter"